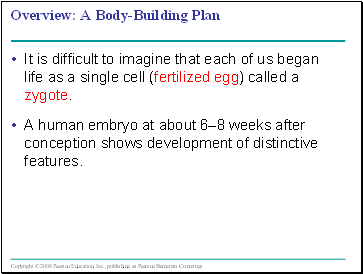 It is difficult to imagine that each of us began life as a single cell (fertilized egg) called a zygote. A human embryo at about 6–8 weeks after conception shows development of distinctive features. 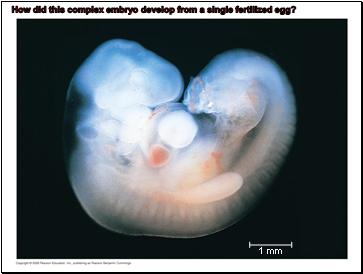 How did this complex embryo develop from a single fertilized egg? 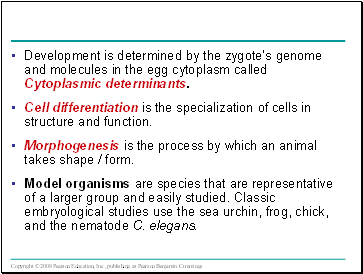 Development is determined by the zygote’s genome and molecules in the egg cytoplasm called Cytoplasmic determinants. Cell differentiation is the specialization of cells in structure and function. Morphogenesis is the process by which an animal takes shape / form. Model organisms are species that are representative of a larger group and easily studied. Classic embryological studies use the sea urchin, frog, chick, and the nematode C. elegans. 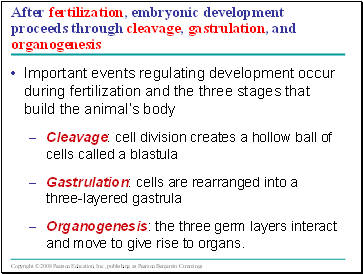 Organogenesis: the three germ layers interact and move to give rise to organs. 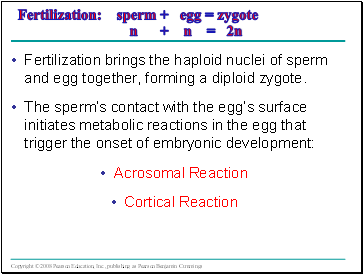 Fertilization brings the haploid nuclei of sperm and egg together, forming a diploid zygote. 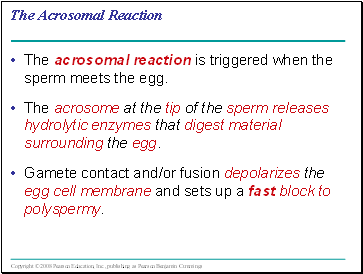 The acrosomal reaction is triggered when the sperm meets the egg. 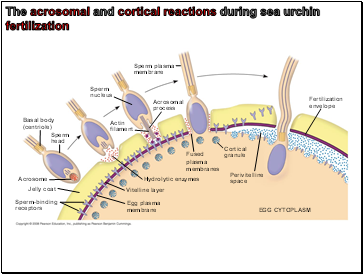 The acrosome at the tip of the sperm releases hydrolytic enzymes that digest material surrounding the egg. Gamete contact and/or fusion depolarizes the egg cell membrane and sets up a fast block to polyspermy.